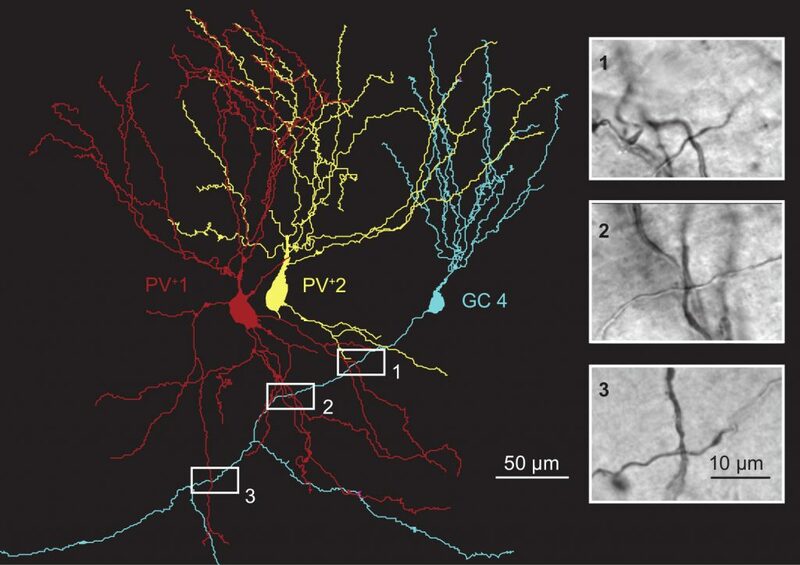 Digital reconstruction of the two parvalbumin-expressing interneurons (red and yellow) and one granular cell (blue) and visualization of the synaptic connections (black & white photographs). © Espinoza et al. Claudia Espinoza is a PhD student in the group of Peter Jonas. Before she joined IST Austria for her PhD studies in 2013, she worked with patients with neurological disorders. This experience motivated Espinoza to pursue a PhD in neuroscience: “I realized that my work as a therapist was very limited because the treatment that we could offer to our patients was very scarce, and actually most of the available treatments are palliative and not curative. The main reason is that the information available about how the nervous system works is very limited, more than what most people believe. This fact motivated me the most for changing my career from a therapist to a researcher. I think that creating knowledge is a beautiful way of contributing something to our society and indirectly to helping people.” IST Austria’s interdisciplinary graduate school offers fully-funded PhD positions in the natural and mathematical sciences. Applications for the next year of study at the IST Austria Graduate School start in mid-October.